Breg's EPO Post-Op Knee Brace features the Easy Quick-Fit hinge for range of motion control. Economically priced solution for surgical recovery. The Breg EPO Post-Op Knee Brace provides an economical solution to post operative protection. The brace features full foam thigh and lower leg coverage, and the Quick set hinge for easilycontrolling flexion/ extension range of motion. The spring loaded set pins are easy to use for setting range of motion limits as desired. Both the foam and straps can be trimmed on the Breg EPO Post-Op knee brace for a precise fit. Adjustable Quick Set hinge stops for flexion/ extension range of motion control. Brace can be locked out in full extension as well with its quick-set hinge. Available in a short (23.5" length) and long (26.5" length) lengths. Please see our sizing chart tab above for important sizing information. An economically priced alternative to the higher Premier brace line. 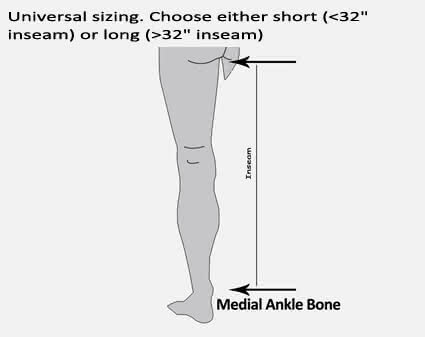 Sizing Chart: Measure your inseam as shown to determine the correct size brace.